rec. 9-15 November 2017, Teatro Goldoni, Bagnacavallo, Italy. DDD. It’s some time since we had volume I (OP30377 – review) and volume II (OP30554 – review – review) of these string concertos, so I’m delighted to see the appearance of their successor after a gap of four years – fourteen since the project began. The previous volumes were performed by Concerto Italiano and Rinaldo Alessandrini1 but turning to Naïve’s other distinguished Italian performers has in no way diminished the quality of the offering. Only the comparatively mean playing time of the second CD slightly tempers my enthusiasm. 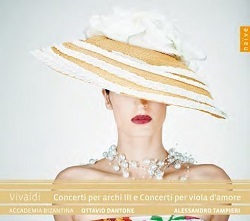 There are six concertos for viola d’amore, RV392-7, and a concerto for viola d’amore and lute, RV540, all offered on a 77-minute collection (with Concerto in F, RV97) by Fabio Biondi and Europa Galante (Erato 3951462 – review, download only) and, slightly less generously but still more fully than on Naïve, by Catherine Mackintosh with the Orchestra of the Age of Enlightenment (RV392-7: Hyperion Helios CDH55178). RV97, 392-7 and 540 are also offered on a fine recording from Çedille which I recommended along with the Hyperion in DL News 2015/9. As the viola d’amore concertos are inextricably bound up with the concertos for strings on the new album – little point in trying to separate them even as downloads – I shall not make detailed comparisons, merely pointing out that if it’s these rather than the other music that you want, they are well performed here, with Alessandro Tampieri as able a soloist as he is a violinist in the string concertos, but the three rival recordings offer equally good recordings of more material. The string concertos are all quite short and lack the virtuoso display of the better-known concertos with one or more soloists. There’s much to enjoy, however, when the music is as well performed as on these three offerings from Naïve. Emphatically, the concertos are sufficiently different from each other to belie yet again the old chestnut that Vivaldi wrote the same work hundreds of times. Try RV155 (tracks 25-28) to see what I mean. Of the few rival recordings devoted solely to the string concertos, I recommend against the elderly I Musici (Philips, download only), which leaves the stylish CDs from Simon Standage and Collegium Musicum 90 (Chandos CHAN0647, 0668 and 0687), single CDs from L’Archicembalo (Tactus TC672259) and Arte dei Suonatori (BIS-CD-1845 – review) and the non-period performances directed by Alberto Martini (Naxos 8.553742). I haven't been able to hear another single-disc recording on Stradivarius. Reviewing the first of the Chandos series and, by implication, the other two CDs, I mentioned that Standage and his team add oboes and bassoons in places to vary the texture. While there is precedent for this in the way that Pisendell performed Vivaldi’s music in Dresden, it clearly demarcates the Chandos series from the Naïve. Purists will insist on the latter and they will be able to point out that Dantone’s direction provides sufficient variety without the additions, while most of us, pushed to make a choice, might prefer to have our ears tickled by the Chandos, though the difference is by no means deal-making or deal-breaking. Because it has a nickname, RV163 ‘Conca’, features on several recordings other than those devoted solely to the string concertos. The name derives from the seashell fitted with a mouthpiece which sailors believed could quell storms, the music evoking the tides of the Venice lagoon. I listened for comparison not only to Standage on Volume 2 of the Chandos but also to La Serenissima directed by Adrian Chandler (Gods, Emperors and Angels, Avie AV2201 – review – DL Roundup). I liked the Avie recording more than my MusicWeb fellow reviewer and re-hearing ‘Conca’, the opening work, I think that Chandler and his team give the outer movements a little more interest than Dantone and his but the latter score with a more serene account of the central andante. Standage’s timings fall between these two in all three movements. It’s not just a matter of tempo, though I think Dantone’s 2:18 for the openingallegro – allegro molto rather too slow and Chandler’s andante a little too matter-of-fact, but that’s evident only in direct comparison. As so often, my Desert Island version would combine the virtues of all three but, as such a thing doesn’t exist – Standage comes closest – I’ll continue to play and enjoy them all, by no means least the new Naïve. Having said that Dantone’s first movement of Conca is rather too slow, I listened to I Musici on Naxos Music Library and that really is, as I expected, drawn out. To give them their due, however, their account of the finale is lively and attractive. This was one of their later recordings for Philips and it’s at least worth a listen. RV152 features on the Archicembalo recording on Tactus. Tempi and performances are similar to those on Naïve except that the Tactus recording takes the second movement, andante molto e sempre pianissimo, rather slowly at 1:39. Neither seems to me allegro molto in the finale. Arte dei Suonatori on BIS take all three movements slowly but you hardly notice because of the vivacity of their playing, even in the andante molto where, on paper, over two minutes should sound snail’s-pace, but doesn't, confirming the view that andante is more an indication of movement than of tempo. A word of advice for downloaders who find their player muddling up the order of the tracks. As is often the case, the ‘artist’ column contains too much and too varied detail and needs to be shortened by deleting everything after ‘Antonio Vivaldi, ComposerAccademia Bizantina, Orchestra, Artist Ottavio Dantone, Conductor’. Back up the tracks first and do it very carefully! If you have been collecting this Naïve series, the new release is well worth adding to your collection. Swings and roundabouts mean that in individual movements I may prefer one of the rival recordings, but overall, I’m very happy to add this to my sizeable Desert Island Vivaldi assemblage. Otherwise you could hardly go wrong with the other recordings that I’ve mentioned, apart from I Musici and even they sound fresher than I recalled. If you just want a single album, the BIS is probably the one to go for, especially as it can be downloaded for just $9.25 from eclassical.com. Though there’s no SACD, there’s also a 24/44.1 download for $12.94; both come with pdf booklet. 1 An earlier set of six string concertos directed by Alessandrini, included in the 66-CD Brilliant Classics Vivaldi box – review – was recorded for Tactus in 1988 and was reissued at mid-price by them in 2013 – review.